Ultimate Courts brings families together with engaging activities that are enjoyable as well as physically beneficial. With a Ultimate Courts Multi-Sport Game Court system you can enjoy everything from basketball and tennis to shuffle board; there is something for all ages. Ultimate Court’s tennis courts have a super grip surface design that delivers an unequaled performance in game play allowing greater safety when jumping and turning. Whether a playing on a commercial or residential tennis court, safety should be top priority. 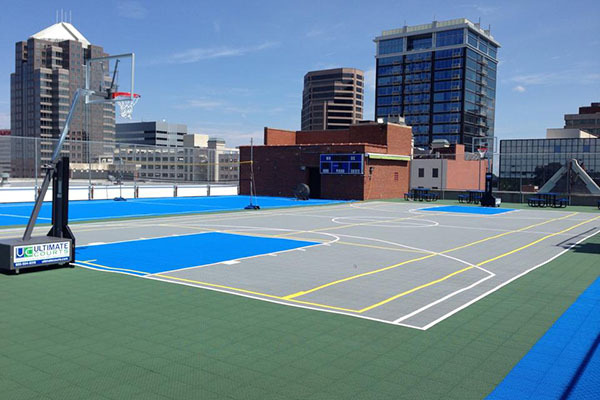 Ultimate Courts is the most innovative basketball court system on the market today. Incorporating the most recent advancements in technology ensure a comfortable, safe surface, ideal for residential backyard or professional basketball courts. Ultimate Courts specializes in both indoor and outdoor sports courts for commercial and home use. Our surfaces are carefully designed and built incorporating the most recent advancements in engineering technology to insure a comfortable and safe playing surface. Color matching and custom designs make for ultimate personalization. Ultimate Courts took a neglected tennis court and turned it into a source of great community pride. We had a limited budget to resurface the court, and Ultimate Court’s multipurpose tile allowed us to make the court seem new again where simple asphalt resurfacing would have cost too much. Not only do we have a great playing surface for tennis, but we see more kids at our park playing basketball as well. We had an excellent experience with Ultimate Courts, and I would recommend them to other communities looking to refurbish their amenities.